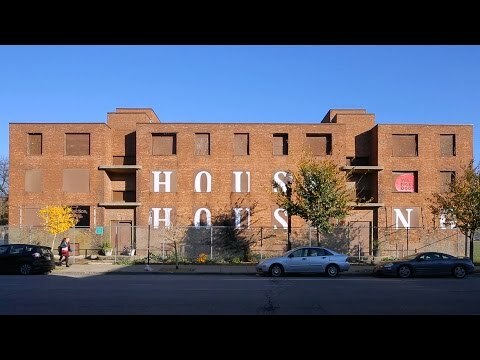 House Housing: An Untimely History of Architecture and Real Estate in Twenty-three Episodes at the National Public Housing Museum's future site in the historic Jane Addams Homes invites visitors to experience history as ever-present, circulating in and through the built environment that surrounds us. Throughout the now-crumbling rooms of the once-pioneering public housing project in Chicago’s Near West Side, the Buell Center has narrated exhibition episodes that the visitor will experience through a mixture of domestic media from across the century—from phonograph to television, answering machine to iPad—converting the former apartments into a whispering, humming history machine. The episodes' objects of inquiry range from floor plans of houses designed by figures as well-known as Frank Lloyd Wright to 9-1-1 calls from seemingly ordinary gated community in Florida; from tax documents of Washington D.C. affordable housing developments to historic photographs of towers demolished by the Chicago Housing Authority. Their untimeliness is two-fold. First, these episodes return public attention to financial matters widely discussed in the immediate aftermath of the 2008 mortgage foreclosure crisis but now largely abandoned, by mainstream discourse, in favor of greener pastures. Second, the historical episodes, which are assembled non-chronologically, disclose surprising repetitions—of themes, tendencies, and actions—which remind us that the economic infrastructures on which architecture rests are the outcome of such repetitions, rather than an a priori, “natural” ground. House Housing was first presented by the Temple Hoyne Buell Center for the Study of American Architecture in the third-floor apartment of Columbia University’s Casa Muraro in June 2014, to coincide with the opening of the 14th International Architecture Exhibition in Venice. Opening shortly after the exhibition in Chicago, House Housing will also appear as a part of the Wohnungsfrage (“The Housing Question”) exhibition at the Haus der Kulturen der Welt in Berlin, and then again in the spring at the MAK Center for Art and Architecture’s Schindler House location in West Hollywood, CA. We, Next Door is organized by NPHM with its “Youth Advisory Council” (YAC) to respond creatively and critically to the House Housing exhibition’s episodes curated by the Buell Center —situating the issues it addresses specifically in Chicago, and in the teens’ lived experience of public housing. NPHM’s curatorial and educational programming team has facilitated the YAC’s interactions in a curriculum funded by Boeing over the course of the Summer of 2015. Working weekly with visiting artists, curators, journalists, architects, and advocates in mentored discussions and creative activities, the youth are addressing the many ways in which they understand the architectural, social, and economic history documented in the House Housing exhibit. We, Next Door presents the outcomes of writing, photography, video interviews, and visual art, and invites visitors of all ages to think more critically about home, house, and housing—thus continuing the conversation about the issues the Buell Center’s exhibition brings to the fore—from the geography of race to issues of gentrification and other manifestations of inequality.